Where in the world is Becki? Well, all over, considering that’s my job. But I sincerely apologize for missing so many updates. I thought a lot about it, and I think two times a week was a reach, and not feasible for my lifestyle in the long run. I’ve since decided that FRIDAYS will be the new update for Novelarnia! Now, on with the topic. I still have a few DFWCon posts left, but I’m going to take a break to talk about what’s been occupying my time the last few weeks. Oh, yes. Because, here’s a hint. Real writers don’t stop writing, ever. So even though I’m (slowly) querying OPERATION OVERLOAD, I’ve started plotting a new novel. This one’s going to be a middle grade story along the lines of the Alanna series. It’ll be my first attempt at high fantasy in, well, years. I’ll dedicate a whole blog post to it later, I’m sure, but for now I’ll say it involves a larger-than-life war between humans and dragons, and focuses on a crippled young girl who joins the elite Huntresses, a dragon-killing army, in order to earn a pair of their artificial wings. It’s going to be a quartet, and I’ll be working on an outline for book 1 in the next week! But the point of this post is the importance of writing buddies! My problem with this novel arose when Beta Krissy, who’s helped me plot virtually everything else I’ve written, responded to the initial idea with hardly any enthusiasm. She has real life things going on, of course, and I didn’t want to waste her time. 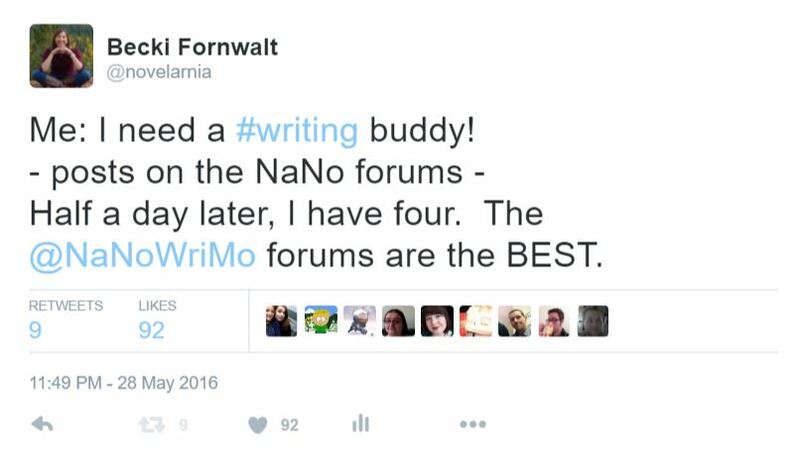 So, I turned to the NaNoWriMo forums, because what better place to find writers in your genre than there? A couple other writers found me after this post, too. It worked well, as you can see! Over the last three weeks, I’ve been plotting almost nonstop with these people. I created a Google doc with ALL of my story notes, and questions at the end for my new betas. Any updates would be tacked on below, and new questions posted as I came up with them. It was amazing, because every day got me several emails from these diligent writers offering ideas. And this novel is going to be GREAT because of it. 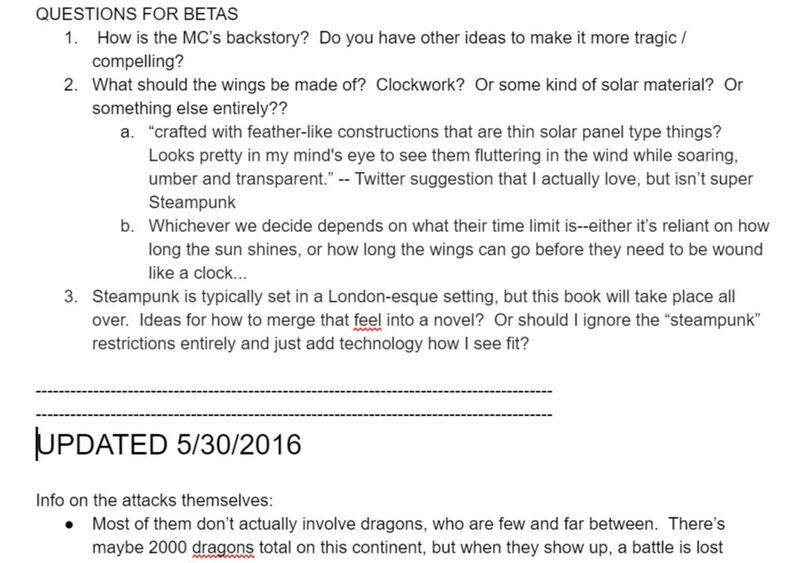 Beta Krissy has excellent ideas, and knows exactly what I love to write, but these people are challenging me. They’re offering solutions I’d never even expect, but ideas I loved once they pitched them! It’s such a fantastic way to expand your plotting abilities! Of course, it’s a two way street, and I’ve been giving them the same feedback on their own novels. Replying to them all easily takes me 2 hours every night. But it’s so, so worth it. And of course, I have about 6 people I’m speaking regularly with. I’d recommend 2 or 3, ideally! So, are you ready to plot your novel? You should be, since Camp NaNo starts July 1st!! If you need encouragement, or someone to bounce ideas off of, check out this thread on the NaNo forums, or post here for genre specific ones, and get your own group of writing buddies. It’ll change your world! Do you have writing buddies, or are you good on your own? Let me know below! Great idea, Becki! Thanks for sharing that link. When I finally manage to swim out from under this final couple of scenes in NBHB@TDI (I think I need a shorter title) I will definitely try it out. I have that YA SF book percolating in my back brain that needs to come out.